Buy 2 or more bottles of Combat Nutra Ordnance for only 23.08 each with free shipping!! 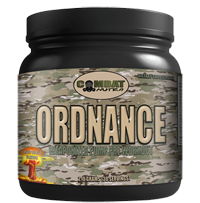 Each scoop of Combat Nutra Ordnance has a serving size of 13g by weight, giving you 30 servings per container. Although this is a pump pre-workout, you are still getting a stimulant boost from 300mg of caffeine. 150mg L-Theanine, which is found to be synergistic with caffeine, as it helps to promote relaxation without drowsiness and is also found to help reduce the perception of stress at the same time slightly improve attention. 500mg of Agmatine Sulphate which is considered to be a neurotransmitter and neuromodulator. 2500mg L-Citrulline Malate and 2000mg L- Citrulline work very well during long periods of aerobic and anaerobic exercise, to reduce fatigue. It also converts to L-Arginine in the kidneys after supplementation, increasing arginine plasma levels in the body over a longer period of time than supplementing with L-Arginine alone. 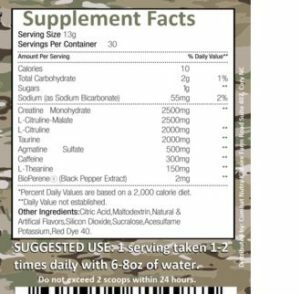 It’s time to try Combat Nutra Ordnance today!! Innovative Labs Wicked (DMHA) 30sv, BOGO Available! !